Currently, the Indian captain is arguably the most consistent and successful batsman across all the three formats of the game. Virat is the most successful batsman across all three formats currently playing and is also the most consistent. On top of that, he is the captain of the squad and is also the holder of some of the biggest records in international cricket. In the last 5 years or so, Kohli has worked extremely hard on his game and established himself as one of the modern day greats of the game. Virat Kohli is still very young but he has achieved some extraordinary things in the game of cricket. After team India lost the Test series 2-1, they came back with a bang in the first ODI. Virat Kohli’s splendid performance in India’s first ODI against South Africa at the Kingsmead in Durban has certainly put a smile on the faces of Indian fans. Virat Kohli is regarded as the Modern Master who scores centuries in run chases as if it is a part of his daily routine. Time and again, Virat has proved why he is one of the best batsmen of the modern generation across all formats of the game. He just continued his momentum from where he left in the Test series. Even in the second ODI, Virat Kohli and Co exhibited world-class cricketing skills and bowled out the Proteas just for 118 in 33 overs. Apart from the clinical performances by Indian bowlers, there is one thing that caught the eyeballs of the viewers and it is the banner that a group of Virat Kohli fans bought to the stadium. 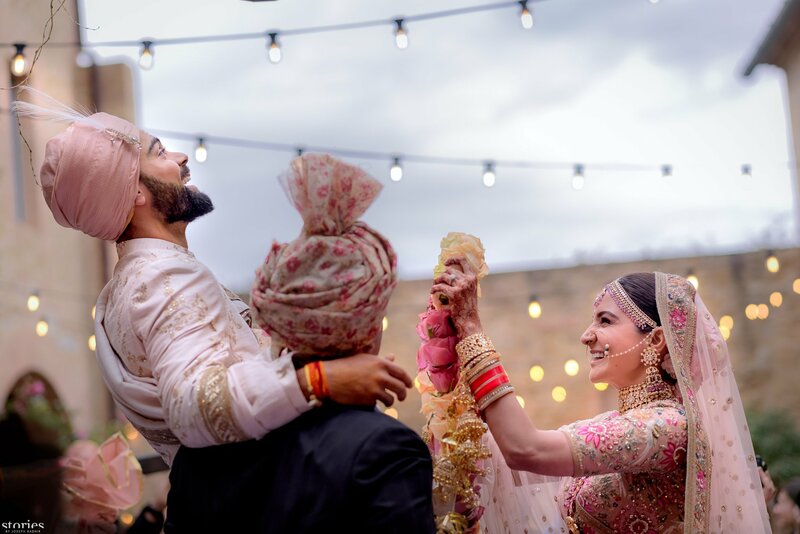 Virat and Anushka make a great pair; they tied the nuptial knot in December and since then, fans are swooning over this beautiful couple. This Bollywood-cricket Jodi is always a hot topic of discussion on social media. Fans keep sharing Virushka’s pics and shower their love upon them. 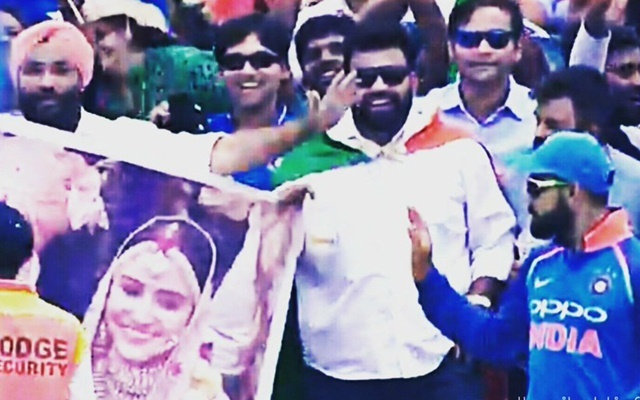 There are some fans who go crazy to any extent for showing their love towards Virat and Anushka. It has been nearly 2 months the duo got married and still, the congratulatory messages are pouring in. 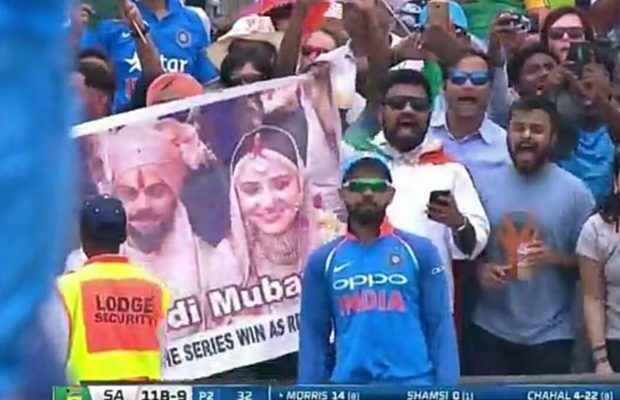 While Virat Kohli was fielding at the boundary rope, one of the fans displayed a banner on which Virushka’s wedding pic and a congratulatory message present on it. It was a beautiful banner and what’s better than Virat seeing it. Virat Kohli instead of ignoring it, he showed a sweet gesture. He waved his hand at the fan and made him happy. 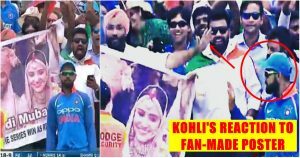 Kohli could have easily ignored the fan as there was a heavy rush in the stands, but instead of that, he preferred to make the fan happy. Kohli may be a feisty character on the field but, he surely knows how to keep his fans who put in a lot of efforts happy. However, team India won the match by 9 wickets with the help of Dhawan’s 51 and skipper Virat Kohli’s unbeaten 46 and is leading the 6-match ODI series 2-0.